The TECH-200 series are the modern microprocessor based controllers with 48 pin wire-set. The TECH-200 series controllers are designed for up to 4cyl. engines. Our controllers combine the advanced technologies with comprehensible functionality. The processor controlling the auto-calibration and auto-adaptation as well as the monitoring and correction system, is confined in to a small, waterproof plastic casing 114 x 140 x 36 mm. The material used in Tech-200 casing has identical properties to aluminum casing. 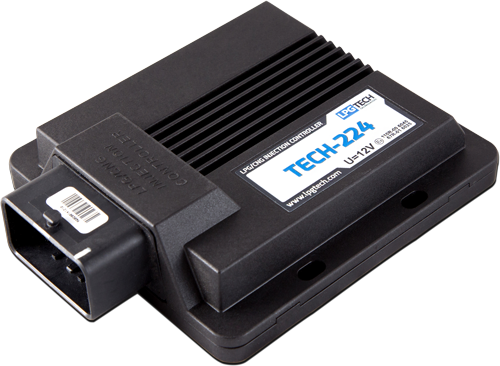 This makes the TECH-200 controllers lighter, less costly and easy to install in every vehicle. The TECH-204 controller consists of all above mentioned functions and protection, guaranteeing excellent quality and performance. Auto-calibration and system settings should not take longer than 15 min. The advanced auto-adaptation system guarantees the trouble free installation performance by monitoring the system and, if necessary, correcting the gas injection times. The TECH-224 controller is an expansion of the The TECH-204. More advanced processor in The TECH-224, allows more efficient command over the whole installation. Also, its software consists of additional settings such as the controller temperature measurement, the frozen frame maintenance and quicker oscilloscope (detailed). Additionally, the injection time control is more precise than in the standard version.